A cabinet shop where you can still find "hands on" craftsmanship! High Quality Craftsmanship at Affordable Prices! Call or email us for more information and prices. SERVING MIDDLE & NORTH GEORGIA, WESTERN NORTH CAROLINA, and EASTERN TENNESSEE. Don't be misled by the theory that custom cabinets cost twice as much as factory ready made cabinets! We design and build what YOU want! Our cabinets are proudly built in our shop and personally delivered to you carefully wrapped in blankets like fine furniture, not pulled off a shelf and recklessly stuffed into cardboard boxes. Stop by for a free consultation and quote before you buy factory ready made cabinets and compare our very competitive prices! 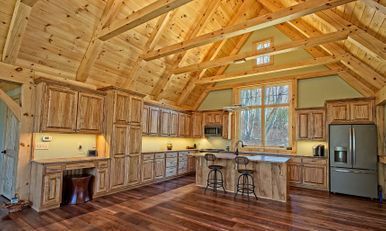 DURFEE CUSTOM CABINETS, INC. specializes in all wood and plywood cabinetry. Only the finest selected woods and furniture-grade plywood's are used to construct our cabinets or furniture. No particleboard, melamine, press-board or MDF at this shop!!!! We will design your kitchen, bath, or furniture for you, or custom build to your specifications. Complete satisfaction is a must and our goal! "Don't settle for less when you can have the best!" "Quality, integrity, and dependability are not just words to us; they are the way we do business." 28 years of cabinet making experience! "Jim Durfee was outstanding ! From the quote to the completion and all in between! We are from the Atlanta area and relocated permanently to Hiawasee .Our home was a total remode..."
Atlanta Area Sales Rep. and Project Manager. Contact Kelly M. Hawley at KMH Designs, LLC., for a design consultation, product details, and project scheduling. Serving - Atlanta, Marietta, Alpharetta, Roswell, Kennesaw, Sandy Springs, Smyrna, Norcross, Buford, Johns Creek, Duluth, etc.